I've missed a few weeks of What's On Your Workdesk Wednesday - life getting in the way again :o) but I'm back! 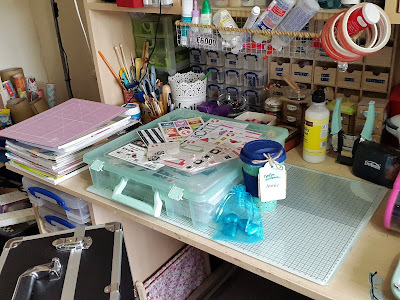 Join us over at lovely Julia's Stamping Ground and show the world what you've been up to in your creative space this week. 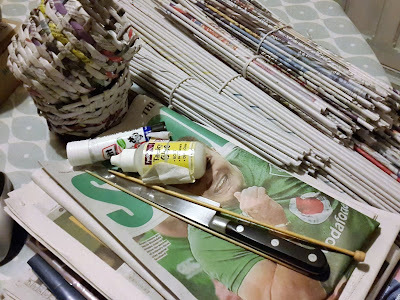 I've been totally obsessed with rolling old newspapers into tubes. There are some wonderfully inspiring tutorials on YouTube showing you how to weave these into baskets - you can see my very first attempts here. 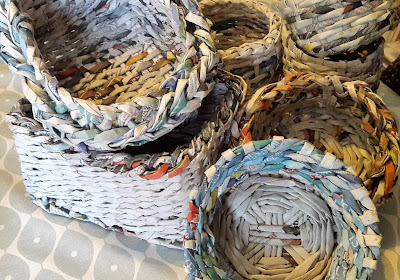 I have a LOT of practising to do before mine look anything like the amazing ones I've seen on YouTube, but even these first efforts are actually useful containers for my craft room. The colours you see here are just as I found them in the newspapers - you can roll towards the unprinted edge to get plain greyish-white and you quickly learn how to roll in the right direction to make use of any colourful parts in the paper - I found that there are a lot of blues and rusty colours (the old teal-and-orange trick in action I suspect). 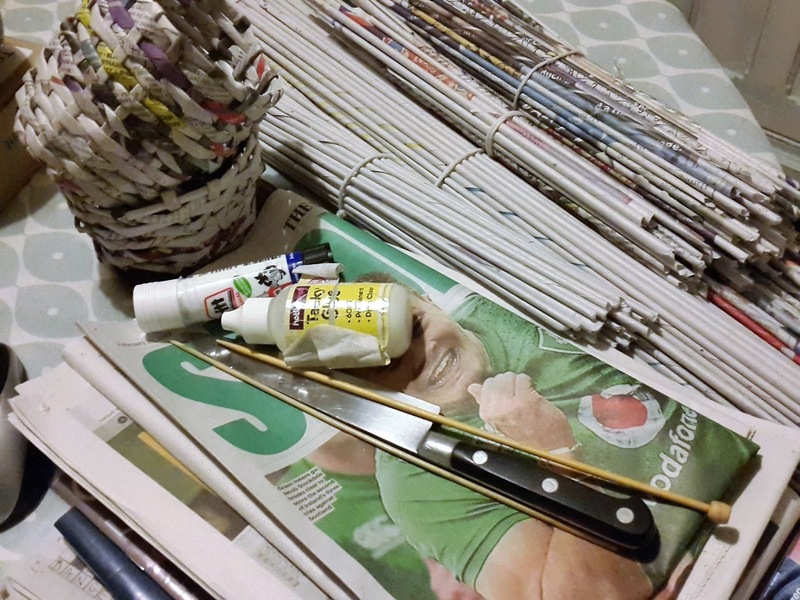 You can also colour the tubes in various ways before rolling, or paint the baskets when they're finished, and apply various decorative finishes - for example napkin decoupage works well. I'll be at work when this posts itself. If I'm lucky and she's not given up on me, my lovely friend Zsuzsa will link up for me, but otherwise I'll do it when I get home from work this evening. Looking forward to a catch-up snooping session later, see what everyone else has been doing this week. I'm loving Wanderlust 2019, enjoying all the different teachers with their varied styles and approaches and learning different techniques and ideas with every lesson. After a coat of clear gesso, I worked with gouache, mixing all the colours from a very limited palette, which is something I need to practice more. I love gouache, to me it has the translucency of watercolours combined with the body and vibrancy of acrylics. 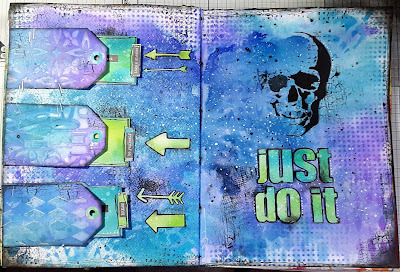 I did use some white acrylic as well, then did the lettering with paint pens. 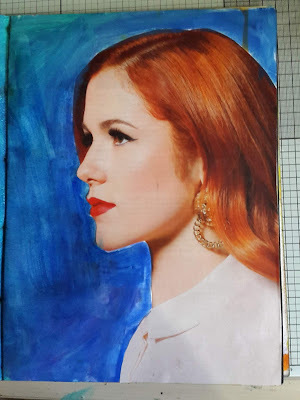 The dark outline around the figure was water-soluble Inktense pencil - as soon as I did that I regretted it, because it made it look "stuck-on" again. Might try and get rid of that when I come back to it. 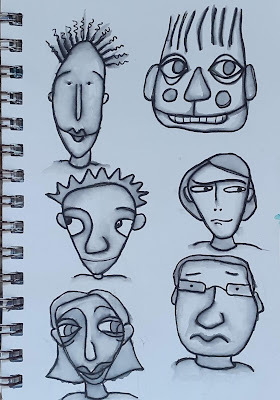 I decided to use Ink Black Inktense pencil - I love how it's SO black, and then you can just use a water brush to give some shading. Now I'm planning to spend a happy afternoon turning one or two of these into a double AJ spread. The next day at work, my hands were still black and blue with ink, but it was SO worth it!! You know how it is when you're looking forward to something for SO long and then it whizzes by and in the blink of an eye it's all over? That happened to me last weekend when my good friend Trina and I went off on a GoGoGetaway - two whole days of scrapbooking classes just flashed past. We got to take the handy carry case home with all our kit leftovers and UFOs inside, as well as the very very cute bamboo reusable coffee cup which I love, and some chocolates for doing the feedback form. I was also very lucky to win the challenge - the prize was a pack of Lawn Fawn goodies which are spread over the top of the storage case in the photo. The challenge was to make a page inspired by a sketch - I made mine a week ahead but forgot to bring it with me, so had to ask DH to take a photo and send it to me so that I could show the GoGo - so I felt double-lucky when my name was pulled out of the bag. Well, thanks for visiting my blog today, I hope you have a lovely relaxing weekend whatever you're doing and wherever you're doing it. See you again soon! 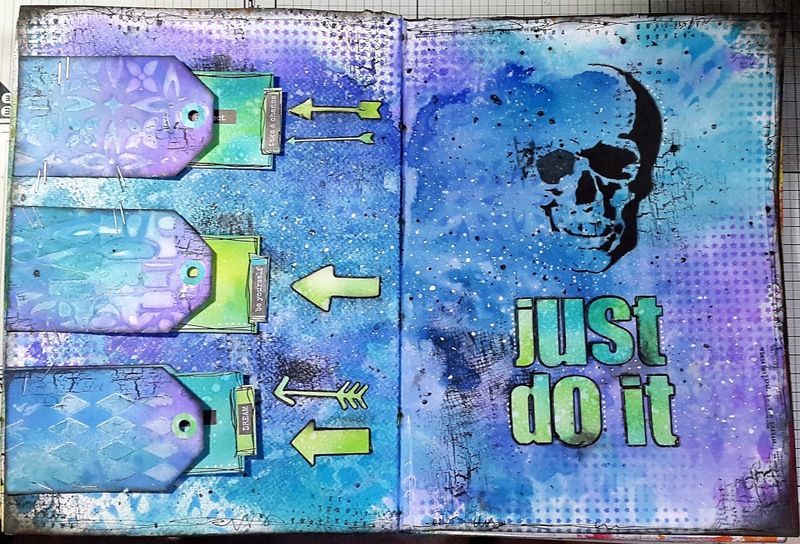 The February Case Files have been released over at CSI: Color, Stories, Inspiration - you can find all the details and check out pages made by the CSI detectives and guest designers over at the CSI blog, plus daily inspiration and ideas on the CSI Facebook page. 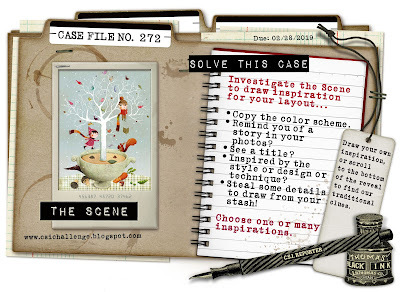 There are LOADS of fab prizes to be won, three different Case Files to choose from and you have until the end of the month, so why not give it go? You can now enter by sharing your pages on the CSI Facebook group so it's easy for everyone to join in. Scheme: all the colours are there, but I chose brighter shades of green and red. Evidence: dots, border, leaves, birds, string, wood. Testimony: I had intended to make a tiny book for my journaling, but I forgot!! 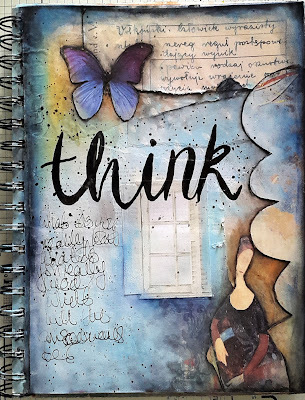 Wanderlust 2019 Week Four - "Think"
I can't believe it's Friday again, a new Wanderlust lesson just came out - better quickly post a pic of my effort for last week, when Kasia showed us how to start with a collage and then add a soft cloudy effect with acrylic paint to create a backdrop for our chosen word of the year. It was so much fun making the clouds that I got a bit carried away and covered up most of my background papers, but you can still see the focal images which came from the gorgeous printable ephemera collection put togetherby Eliza Trojanowska for Wanderlust 2019. The scribbled text reads, "What do you really want? What do you really need? What will the consequences be?" 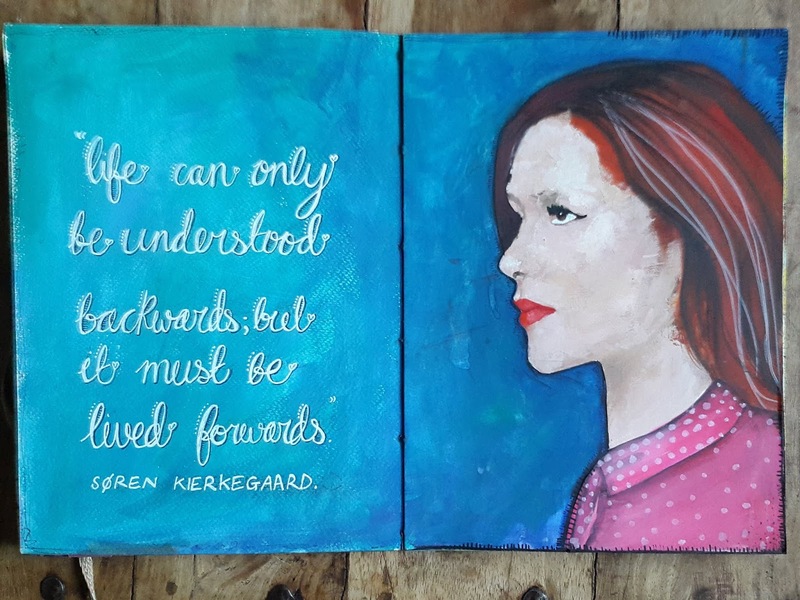 which is my mantra for 2019.